There is an eBay auction that caught my eye specifically because it had some “vintage” New York Rangers included in it. This 1968 Leroy Neiman oil painted masterpiece is valued at around $200,000 but the 89-year-old painter will let it go for $89,000. The players involved are pretty special. That “No. 1” for the Rangers was Eddie Giacomin and his number has been hanging from the rafters from Madison Square Garden since 1989. It was the second number retired by the franchise. I love the way he’s playing so deep in the net (without a mask), very few goalies do that these days. Collectors often clamor for more interaction with trading card companies — feeling the need to tell them their demands while also telling them what they don’t like, telling them what they do like and more. Sometimes, for varying ego-related reasons, individuals insist they should appear on a card inside a Topps wrapper, too. Now, they can … sort of. Found in packs of the upcoming 2010 Topps Series 2 baseball cards will be Topps “You Sketch It” cards that have blank fronts that can be drawn upon and sent back to Topps for the chance to possibly win a prize (according to sales materials) and potentially have their sketch cards inserted into future Topps products for collectors to discover. Talk about interactive and potentially influential for a product. A crowd-sourced baseball card set? If they’re good, it could be interesting. Who wouldn’t want to find their card in a pack? We’re back with another Free Stuff Friday our weekly ritual where we try and get some cool stuff into the hands of our readers just for answering some simple card-related trivia — and this week’s biggest prizes are courtesy of Topps. Join Beckett Media’s Tracy Hackler, Chris Olds and Brian Fleischer as they bust into a pair of 2010 Topps National Chicle baseball cards for this episode of Box Busters. What will they find inside? Watch and find out by clicking here. While plenty has been said about the forthcoming 2010 National Chicle baseball card set from Topps, only a few have gotten their hands on the actual cards — well, other than all those athletes who signed on-card autographs — in advance of its release next week. But the Beckett crew has busted a pair of hobby boxes for an upcoming Box Busters video — perhaps a pair of interesting, perhaps controversial breaks — and the results are in the microwave for now readying for release tomorrow. On the day that the New York Yankees receive their World Series rings, artist Opie Otterstad has unveiled his latest piece, which will be displayed publicly at Pop International Galleries, in the SoHo district of New York City on Saturday. The 24×36 prints showcase a montage of Yankees images celebrating the team’s record 27th championship. They are limited to 209 hand-signed and numbered copies, which cost is $1,650. 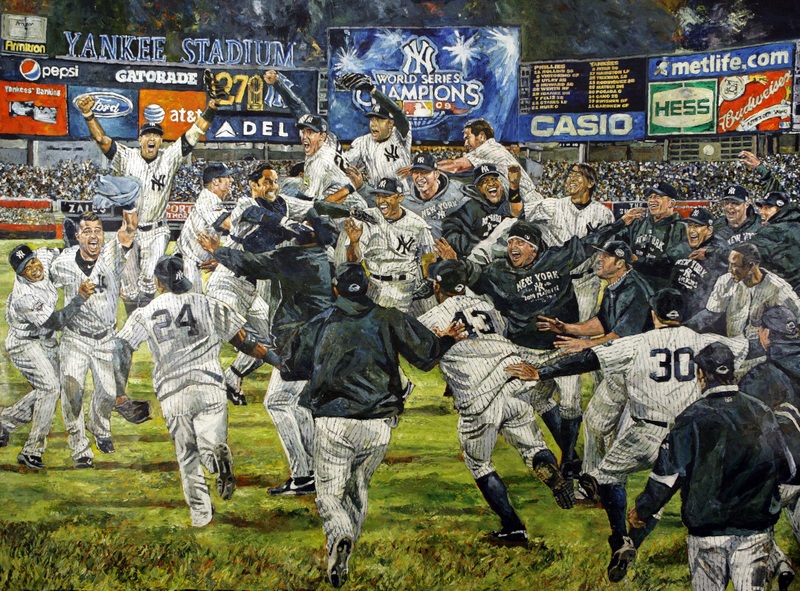 For the past seven years, baseball fans have looked to Otterstad for his panoramic paintings capturing World Series victories — this being the first for the Bronx Bombers in that time. Showing alongside Otterstad at Pop International will be renowned artist Stephen Holland, who will debut three Yankees portraits — Derek Jeter, Mariano Rivera and Alex Rodriguez. “The Yankees and their iconic players as painted by Opie and Holland are just as much a part of ‘popular culture art’ as Warhol’s Monroe,” said Pop International co-owner Rick Rounick. For a closer look at the piece, click on the image above. The Super Bowl has come and gone — but New Orleans Saints fans still can’t seem to get enough of their championship team’s memorabilia. 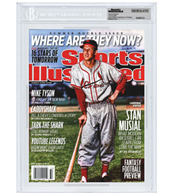 Here’s a piece that’s a little different than the typical sports cards, tribute magazines or autographed memorabilia that’s been hot for the last month or so since the Saints took out the Indianapolis Colts, 31-17. It’s the official Super Bowl XLIV portrait by Tony Capparelli.